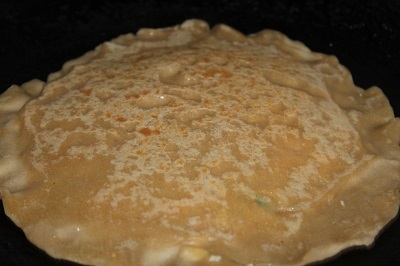 Paneer paratha is an Indian flatbread made with whole wheat flour and stuffed with paneer / cottage cheese filling and flavored with Indian spices. It is a very healthy breakfast or dinner option. 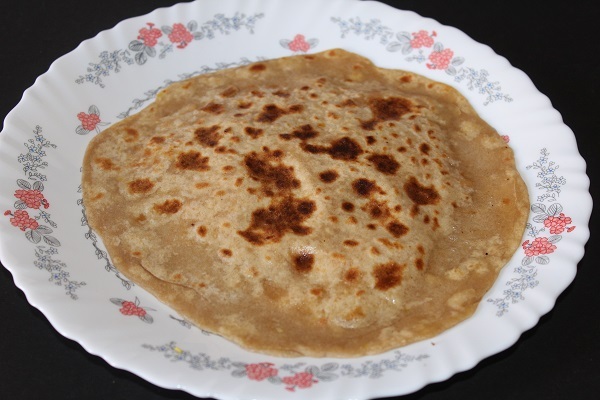 This paratha can be served with curd / raita or green chutney and pickle. Usually I make idli / dosa for breakfast, but after trying stuffed parathas, there is no looking back. Now we make parathas at least twice in a week. It is not necessary that the filling should be just paneer alone. You can also try to add other vegetables like palak, carrots or potatoes with paneer. This will also be tasty and nutritious. 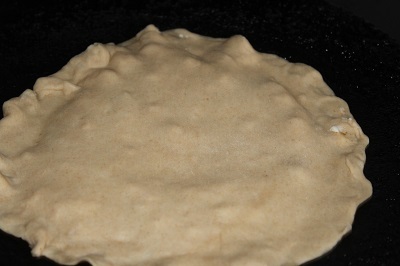 Here, I have given the method of making two chapathis , adding the filling on one and sealing with the other. This is one method and if you don’t like this method, you can also follow the method of rolling the parathas. Roll the dough to a small chapathi, put the filling in between, seal the edges and roll it again to make small circles of desired thickness. Now to the recipe..
1. 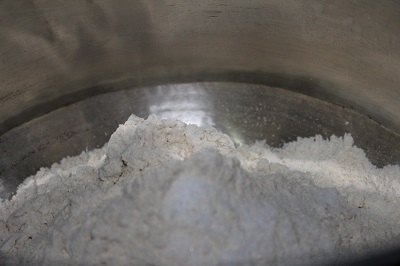 Take wheat flour in a wide mouthed bowl. 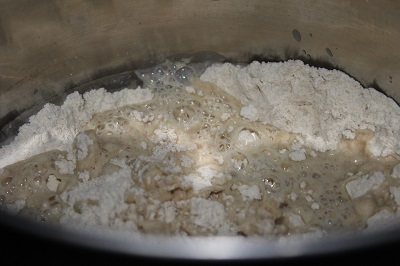 Add salt and ghee to it, and mix well. 3. 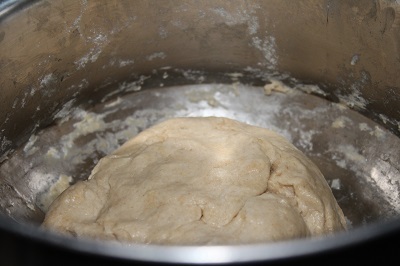 Cover the dough and leave it aside for 10 -20 minutes. 4. Next, in another bowl or plate, crumble paneer and and add finely chopped onion, green chillies, red chilli powder, garam masala and salt. 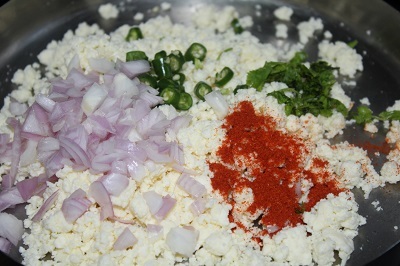 Mix well so that the powders get uniformly mixed with the paneer. 5. Take two small portions of the dough, roll them in your palms and make small balls. 6. Dust the balls with flour. 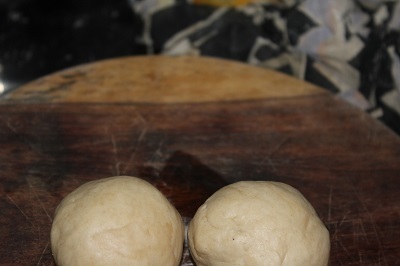 Then with rolling pin, roll the dough balls into circles of required thickness. Keep it aside. 7. Same way, dust the other ball also and roll into a circle of same size. 8. 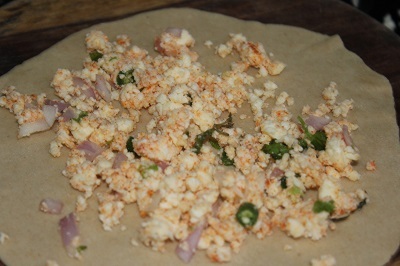 Place paneer stuffing on the rolled circle. Keep some space around the ends to seal both circles together. 9. Now, cover with the other rolled circle and press edges well to cover properly. 10. 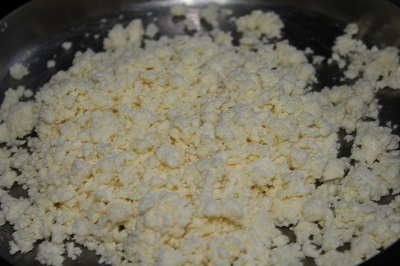 Sprinkle flour on top and gently roll it once more. 11. 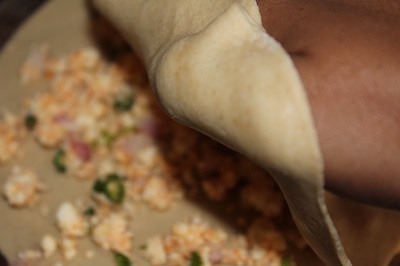 Heat a griddle and then place the rolled paratha on top. The tawa should be hot enough. 12. When one side is partly cooked, flip to the other side. Apply ghee on this side. 13. Then again turn over and flip. Apply ghee on this side also. 14. Flip again. Press the edges with the spatula so that the edges also get cooked well. 15. Repeat this until golden brown spots appear on the paratha. Transfer it to a serving plate. 16. Clean the tawa with paper napkins to remove burnt flour, before you make another paratha. 17. Paneer paratha is ready to serve. Serve with butter, pickle or yogurt.